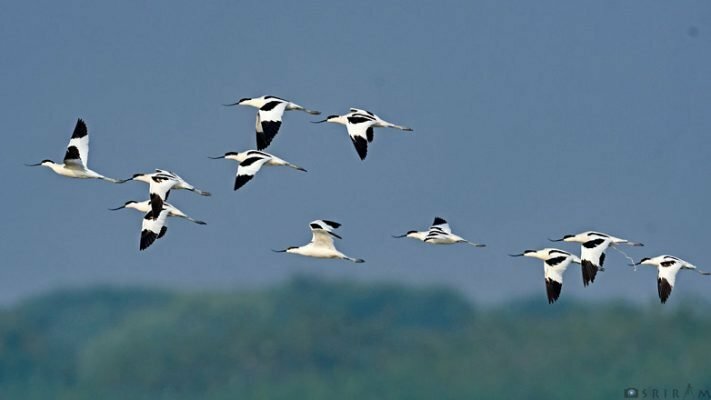 Meanwhile, another seasoned birder, Sriram Reddy sighted the Pied Avocet, a winter migrant bird at Anna Sagar Lake during this week. Sangareddy: Wildlife conservationists are elated as a juvenile Egyptian vulture was found near Anna Sagar recently, last time such vultures were sighted at Gachibowli in 2016. Birders in Telangana are happy to find vultures in these parts of the State as excessive use of diclofenac has pushed the bird into almost extinction in India. Since IUCN (International Union for Conservation of Nature) classified the Egyptian vulture as an endangered species in the world, birders and ornithologists have been relieved by the sighting of the vulture in Sangareddy district. Seasoned birder, Balakrishna Marar had captured the bird at Anna Sagar near Jogipet during this week. Since the bird is a juvenile, experts in the field said there could be more Egyptian vultures around. Pied Avocet captured by Sriram Reddy. vultures in and around Anna Sagar,” said Fareed Mohmed, a birder. The Juvenile must be living with its parents around Anna Sagar, he added. The vultures was found breeding in Gachibowli area around two years ago. Apart from a few Long-billed vulture’s which are found in Bejjur Forest area, Egyptian vulture are seen rarely in Telangana. Balakrishna Marar and other birders are planning another birding trip to Anna Sagar to scout for more vultures in Jogipet area. Meanwhile, another seasoned birder, Sriram Reddy sighted the Pied Avocet, a winter migrant bird at Anna Sagar Lake during this week. The birds were seen last during 2016 winter season in Telangana.